How tall is my ceiling? Sounds like a simple question, but the true "lift installation" height of your ceiling can actually be higher than you think. 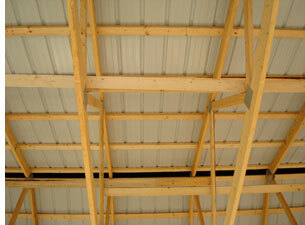 If you have a finished ceiling or a metal roof, then it is rather easy to measure your true ceiling height. 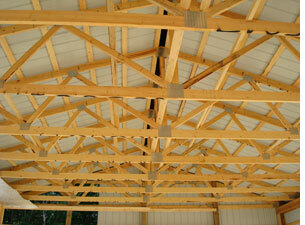 However, many of our customers have an open ceiling. If your ceiling looks like these pictures, you may have some options. 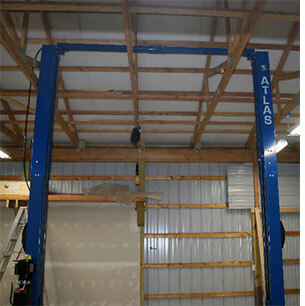 Your ceiling may "qualify" for an overhead lift rather than a base plate lift. See the differences between Overhead and Baseplate 2-Post Lifts. The OH beam may be able to be positioned between the rafters (if the rafters are "running parallel" to the OH beam) or the OH beam may be positioned OVER the rafters (if the rafters are "running perpendicular " to the OH beam). Obviously, the bottom of the rafters are going to be the limiting factor of how high the vehicle can be raised. Of course, some ceilings may be modified to accommodate all varieties of lifts and lifting methods. 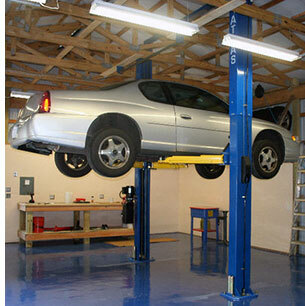 We suggest that you consider all your options before you decide that the only style of lift that will fit into your garage is a "base plate" lift.